Reasons Europe - Reasons the Healthy Drink to lose Weight! A drink to help you lose weight! Burn more calories during exercise! 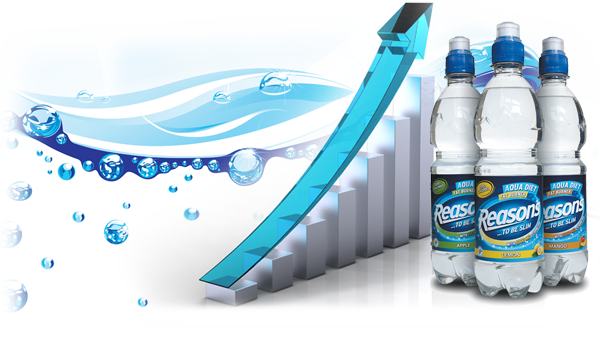 For optimal effect: 1 - 2 bottles throughout the day! L-Carnitine stimulates the burning of calories and helps people who want to lose weight. L-Carnitine facilitates the transport of fats to the energy centres in your body, where they are burned and converted into energy for your muscles. L-Carnitine improves the energy production in your body's cells and contributes to recovery after exercise. The use of ingredients from quality suppliers in Europe directly contribute to the quality of Reasons and the satisfaction of the consumers. 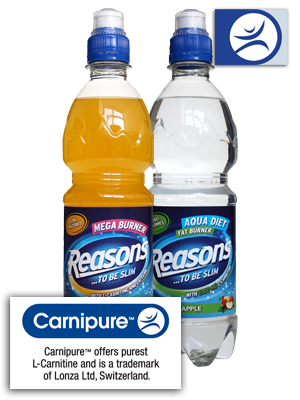 Reasons contains L-Carnitine of Carnipure from Switzerland and quality mineral water from Europe. For optimal effect: 1 bottle one hour before exercise and 1 bottle during exercise. Aqua Diet can be drunk without limitation throughout the day. 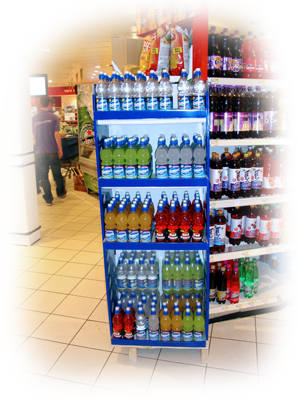 Aqua Diet drinks are suitable for diabetics and people with chronic fatigue syndrome. Aqua Diet: contains zero Calories. 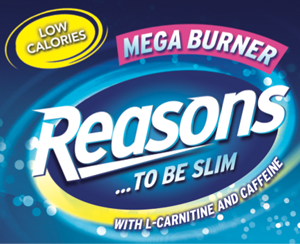 Reasons Mega Burner is a specially designed diet drink that helps the body to burn calories more quickly and suppresses the feeling of hunger. 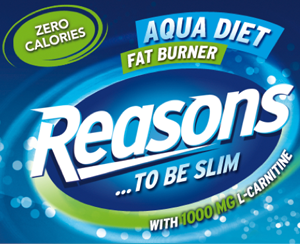 Reasons Mega Burner contains specific, natural ingredients that stimulate the burning of calories and help you to become slimmer. The natural ingredients not only burn calories, but they also decrease feelings of hunger. This helps you lose weight even faster. For optimal effect: 1 - 2 bottles throughout the day. Reasons Mega Burner drinks are suitable for diabetics and people with chronic fatigue syndrome. The Aqua Diet contains zero calories. The Mega Burner contains caffeine which gives you more energy. Both types come in various flavors. Why choose wholesale and retailers to take Reasons in their selection? Reasons is often part of the diet of many consumers which results in repeat purcases and customer loyalty. Quality ingredients are used for Reasons. This keeps the flavor and the good function of Reasons. It also keeps the customers satsified. The wholesale and retailers have attractive margins and can use consumerattractive prices. 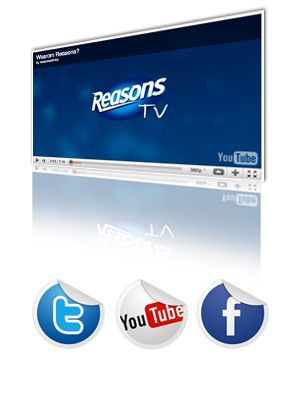 ReasonsTV is the online TV Channel of Reasons. Video's are produced throughout the year and distributed through Social Media. The effective use of online tools like social media helps to remain connected with the target audiance. TV and print advertising will contribute to the exposure of Reasons.